The Highgate Cemetery, located in Highgate in London, England, was opened to the public in the year of 1839. This particular cemetery establishment was part of what is often referred to as the "Magnificent Seven". The region felt it necessary to provide seven new large based burial grounds to the area and this was one of those to be included. Most of the graveyards that were actually located within the city limits were part of the churches there and were becoming overpopulated. A man by the name of Stephen Geary came in and drew out the design for the Highgate Cemetery. He is the architect fully responsible for the appearance of the haunted cemetery. There are many notable individuals that were laid to rest in this haunted London cemetery. One of the most popular of all individuals is the famous Karl Marx. The author of "The Hitchhiker's Guide to the Galaxy", Douglas Adams, is also buried there. The parents of Charles Dickens, William Kingdon Clifford, Max Wall, Adam Worth, and numerous other's graves can be found within the gates of this popular cemetery. For some, it is not the notable names buried within the Highgate cemetery that make it so mystifying, it is the fact that there appears to be non-living entities residing in and around the burial grounds as well. Many paranormal investigators have established that this place is haunted and possibly even has its very own vampire! 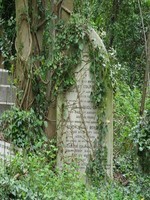 The Highgate Vampire is believed to be just one of the several hauntings that occur at the cemetery. In the early years of the 1970s, several young people gathered together and elected to walk through and around the grounds of the cemetery. On the 24th day of December in the year of 1969, one of these people claimed that they saw a strange man walking by the cemetery. It was believed that this man that he saw was a spirit. The name of the man that saw this strange man was named David Farrant. Most of the people that were exploring the cemetery did not observe the particular individual that he spoke of, but it is said that they witnessed other apparitions and events that seemed to be paranormal based. There was one other individual named Sean Manchester that claimed that he observed the same entity that David did in the Highgate Cemetery. Based on his knowledge of England's history, he believed that the spirit that they observed could have been the famous "King Vampire of the Undead". While considered to be an outrageous story among most, those in the country believed it to be true. It is said that the "Vampire" was a nobleman during the medieval times. He practiced black magick during his lifetime, so many associated that with Witchcraft and Vampirism. The man was transported from the area of Wallachia to England, but was confined by a coffin. In the early 1970s, it is said that there was a local group in England that was believed to have been practicing Satanism. Naturally, the satanic cult took an avid interest in the final resting place of the supposed "Vampire" and made many efforts to summon him. It appears as if they were successful. The gray colored, ominous character lurking among the tombstones in the Highgate Cemetery is believed to be the vampire that legend has spoke of all throughout history. Eventually, the group of young people would split off into two groups and compete for who would find and finally kill the supposed vampire. However, to this day, no such creature has been located or captured. 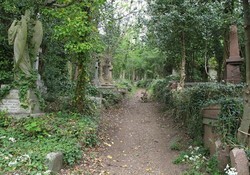 The haunted Highgate Cemetery is also said to contain the spirit of an older woman. It is unknown who the woman is, or why she is wandering in the London, England cemetery, but several witnesses have observed her. She appears to be an intelligent haunting according to some because of the way she apparently disappears once observed, but not much is known about this ghost at all. If you are going to the Highgate London England area and want to experience a haunted cemetery for yourself, you may find that the Highgate Cemetery is an intriguing location. Simply swing over to Swain's Lane and you may see the popular Highgate Vampire yourself! Perhaps you will be able to identify the spirit of the elderly lady that roams the rows of the dead.